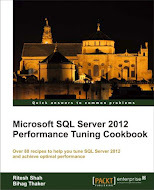 Our book “SQL Server 2012 Performance Tuning cookbook” is published this week. This book is based on the concept of performance tuning in SQL Server 2012. We have one chapter “Implementing physical Database Structure” in our book “SQL Server 2012 Performance Tuning cookbook”. Following article is completely based on the chapter we have in our book “SQL Server 2012 Performance Tuning cookbook”. Database structure is one of the important factor which affects performance of your database. Your database performance heavily depends on how you have physically placed your database objects and how you have configured your disk subsystem. Designing the physical layout of your database correctly is the key factor to improve the performance of your database queries and thus the performance of your database. However, the correct decision on a physical design structure of the database depends on the available hardware resources that you might have. This includes the number of processors, RAM, and storage resources, such as how many, disks or RAID controllers you might have in your database environment. The best thing while designing physical layout of the database is to have multiple physical disks for your database. If you configure your database in such a way that it spreads across multiple disks, it can benefit from parallel I/O operations. Where do you place data files? Where do you place log files? Where do you place large objects? Where do you place indexes? Where do you place the tempdb database? You can control the physical location of database objects within the database by using files and filegroups. To read complete article kindly click here. This entry was posted in database structure, SQL Server 2012, SQL Server Performance Tuning and tagged database structure, Microsoft, MS SQL Server, Ritesh Shah, sql server 2012 performance tuning cookbook on July 28, 2012 by Riteshshah.